A consensus has emerged amongst the partner countries that the Isaac Newton Group of Telescopes (ING) will play a crucial role in the partners' national astronomy programmes over the next decade. At the ING, we have worked closely with our user communities from the UK, the Netherlands and Spain, and with our funding agencies (STFC, NWO and IAC), to agree on the scientific priorities and how to deliver them. The WHT remains the focus of our strategy. Until at least 2017, we will continue to offer classical observing, and ING will continue to welcome visitor instruments at the WHT. Several technical and operational enhancements are planned. For example, we are seeking approval of a new model for time allocation that introduces long-term programmes through a common TAC. From ~ 2015, users will have access to a new visitor instrument, PAUCam, an innovative imager designed to deliver high-precision photometric redshifts over a wide field of view at WHT prime focus. ING's strategy for the rest of the decade includes the development and deployment at the WHT of a powerful wide-field multi-object spectrograph, WEAVE. First light is planned for 2017, and WEAVE will over the following ~ 5 years carry out several ambitious spectroscopic surveys. A follow-up of ESA's Gaia mission, for example, will measure the radial velocities of ~ 1 million stars, and is expected to revolutionise our understanding of how the Milky Way was assembled. A growing partnership between ING and Grantecan should lead, over the next few years, to a more efficient and cost-effective operation on the mountain-top. This partnership also opens up the possibility of future UK/NL access to observing time on the 10-m GTC. Thanks to the ING's creative user communities (and to high-quality instrumentation on an excellent site), the WHT and INT have been very productive(1,2) for over two decades. To encourage the continuing involvement of the ING communities in defining the scientific future of the observatory over the next decade, a meeting 'Science with the WHT 2010 - 2020' was organised in London in March 2010, and users were invited to express their views about future instrumentation requirements at the telescope. Consultation with the communities continues at a second meeting, 'Science with the optical-infrared telescopes at CAHA and ORM in the coming decade', in Madrid on 22-23 March 2012. A workshop "Science with the William Herschel Telescope 2010-2020", was held in London in March 2010. Two messages emerged from the 2010 London meeting. Firstly, there was strong support for providing a wide-field, multi-object spectrograph (MOS), in particular for follow-up of large-scale surveys from space missions such as Gaia, Herschel, and Euclid, and from ground-based facilities such as LOFAR, UKIDSS, VISTA, and DES. There is significant involvement in all of these projects by astronomers from the three ING communities. Secondly, it became clear at the London meeting that the demand for classical observing will remain high in our communities for some time to come. Diverse instrumentation, including novel visiting instruments, was acknowledged as being a key ingredient in fostering original and innovative science. The WHT continues to be in high demand in the UK, the Netherlands and Spain, with UK time over-subscribed by a factor of 2.7. Key to the future demand is Northern-Hemipshere access, which the UK and the Netherlands would lose without the WHT. Northern-Hemisphere access is needed for science requiring all-sky coverage (e.g. Gaia follow-up, or target-of-opportunity observations of unusual GRBs, SNe); and to study specific Northern-Hemisphere targets, such as the Kepler field, the Andromeda galaxy, other local-group galaxies, Milky Way tidal streams, and the Virgo, Coma and Ursa Major clusters of galaxies. When the UK pulled out of Gemini in 2013, the WHT became the largest optical telescope in the Northern Hemisphere to which UK astronomers have guaranteed access. 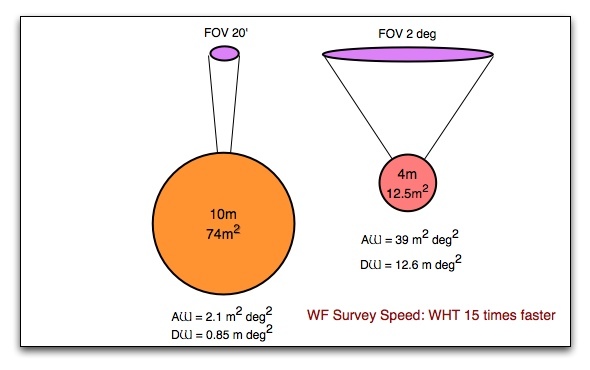 For the Netherlands, both the WHT and INT will be important e.g., for optical-infrared follow-up of LOFAR surveys. For Spain, the WHT remains an essential general-purpose telescope alongside the 10.4-m GTC. Strong support for developing a northern wide-field MOS can be found in several recent high-level reviews, including STFC's 2009 'Ground-based facilities review' Astronet's 'Science vision for European Astronomy' and Astronet's 'Infra-structure roadmap'. In general, wide-field MOS is thought to be a key area where 4-m telescopes can contribute high-impact science in the era of 8-m telescopes (see e.g. the ETSRC report). With the demise of several other possible MOS opportunities, the WHT is now the leading contender to host Europe's most powerful MOS in the Northern Hemisphere, and this has enthusiastic support from the three ING partners, and from ASTRONET. Survey speed (number of faint targets that can be detected at given S/N, per unit time) scales as the product of primary mirror diameter D and solid angle W accessible to a single observation. A 4-m telescope with a 2-degree FOV has 14 times the survey speed of a 10-m telescope with a FOV of 20 arcmin. A large international science team has now developed a compelling science case for a powerful WHT MOS, to be called WEAVE. The case focuses on three major surveys, addressing: (1) Milky Way archaeology (Gaia follow-up, building on European strength in this area); (2) galaxy evolution; and (3) the nature of dark-energy. The goals are summarised on the WEAVE science page. These surveys create a potential for fundamental scientific contributions from the partner countries. A consortium including UK, Dutch, Spanish and French institutes is now in place to design and build WEAVE, with funding secured up to and including preliminary design, completed in mid-2014. From 2017, a large fraction of WHT time will be devoted to completing the three planned surveys with WEAVE. WEAVE at WHT prime focus: the new corrector (housed in the blue section, above) delivers a 2-deg field of view. 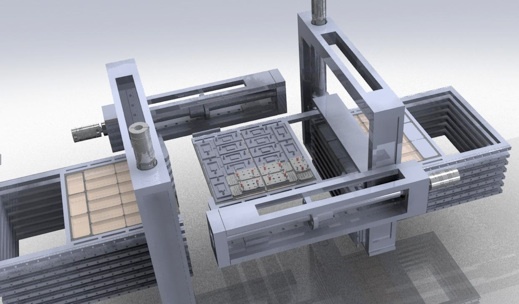 The positioner (grey, above) comprises 2 sets of 1000 fibres, such that one set can be configured while the other is used for observing. Integral-field units can also be deployed in the focal plane. The fibres feed a dual-beam spectrograph mounted on one of the WHT's Nasmyth platforms. Two spectroscopic resolutions are available: R ~ 5000 for spectra covering the full optical range; and R ~ 20000 for spectroscopy over restricted wavelength ranges. During the build-up to WEAVE, we plan to offer the WHT with its current instrument suite, although there may be some rationalisation of the facility instruments, focusing resources on those which are most scientifically productive. Some upgrades of the facility instruments are already planned, e.g. a new red-sensitive, low-fringing CCD for the AF2 prime-focus multi-fibre spectrograph. The science delivered by the WHT during 2013 - 2017 is likely to cover a broad range of topics prominent in e.g. Astronet's 'Science vision for European Astronomy', from exoplanets to dark energy, reflecting both recent successes and upcoming opportunities. Examples of new scientific opportunities include: the the discovery of exoplanet candidates by Kepler and SuperWASP; the need for pilot studies for Gaia; the possibility of carrying out wide-field redshift surveys (PAUCam) for DES and Euclid; the LOFAR survey and its Transients Key Science Project; the dramatic rise in the number of supernovae being discovered, by Pan-STARRS and the Palomar Transient Factory; and a likely increase in the rate of gamma-ray burst discovery when SWIFT's successors come online. ING will encourage the three partners to contribute to a common pool of observing time for long-term programmes. This would comprise a fraction of the time due to each of the partner countries, and would be allocated by a common time-allocation committee (TAC). The remainder of the time would be allocated by the existing national TACs. After the WEAVE surveys begin in 2017, and depending on community demand, some fraction of WHT time may continue to be available to ING users for observing with other facility instruments (or for non-survey WEAVE observations). The WHT plays a key role in instrument innovation and development in the laboratories and universities of the partner countries. Bringing a private instrument to the WHT is more straightforward than doing so at e.g. VLT, and during a typical semester, ~ 6 visitor instruments are deployed at the WHT. Recent examples includes EXPO, FASTCAM, GHaFaS, PNS, SAURON and ULTRACAM. The visitor instruments deliver ~ 20% of the WHT's scientific impact. 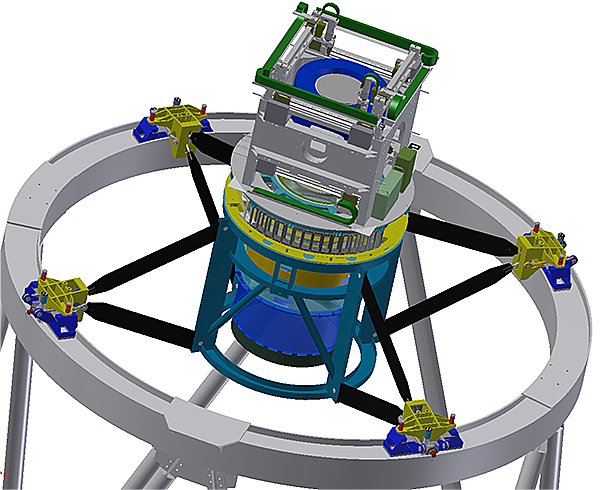 The WHT is also a testbed for technologies to be deployed at E-ELT, with Durham's CANARY, prototyping the wide-field laser-guide-star tomography to be used in E-ELT EAGLE, currently deployed on one of the WHT's Nasmyth platforms. During 2013 - 17, ING will continue to extend a welcome to visitor instruments. 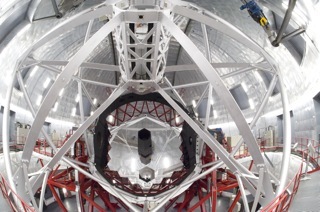 In 2015, a new visitor instrument, PAUCam, will arrive at the WHT. PAUCam will be mounted at WHT prime focus, and is an 18-CCD wide-field imager equipped with 36 narrow-band filters (and a set of broad-band filters), designed to deliver photometric redshifts z with accuracy δz~ 0.0035 (1 + z), across a wide field of view. The camera will be used by the PAUCam consortium to carry out a large survey (~ 100 nights) aimed at constraining the dark-energy equation of state via measured redshift-space distortions. PAUCam will be available to the ING user communities through the usual time-allocation committees. PAUCam's filter-tray system, showing a tray inserted in the focal plane, just in front of the CCD. The role of the WHT and INT in student training is highly regarded in all three partner countries. Many UK, Dutch and Spanish PhD and MSc theses are based on data from ING telescopes. In the UK alone, since 2009, 53 PhD theses based wholly or in part on ING data have been completed, or are in progress. 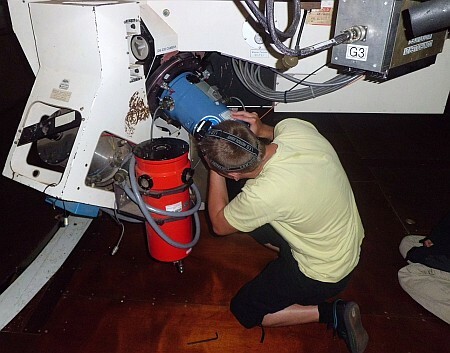 The proximity of the telescopes to Europe also allows students to get hands-on experience of observing in a way which is not possible at most larger telescopes. The resident-studentship programme at the INT is also highly regarded. Over the last 10 years, 40 students have each spent a year working on La Palma as INT support astronomers, thereby acquiring a broad range of observational, technical and support skills. Student support astronomers are responsible for afternoon setup of the instrument (above, setting up the IDS), as well as night-time support. The ING is enthusiastic about the arrival at the Observatorio del Roque de los Muchachos (ORM) of the 10.4-m GTC With superb optics and state-of-the-art engineering, the GTC offers unprecedented potential for discovery at our superb site, and keeps the ORM in the first rank of world observatories. The 10.4-m GTC, the largest single optical telescope in the world, began science observations in 2009. ING and GTC have agreed on a framework for technical collaboration between their two highly-qualified teams. This will likely grow in the coming years to fully exploit the benefits of technical and scientific synergies between the two organisations. Down the line, this partnership also opens up the possibility for the UK/NL to access observing time on GTC, currently shared by the GTC partners Spain, Mexico and the University of Florida. It's a time of change at El Roque, and the ING aims to take a lead in exploiting for our partners the best observational opportunities that arise.